The Short Version: The Melanoma Research Foundation is a nonprofit organization that gives support to melanoma patients and funds clinical therapies in search of a cure for the deadly disease. Melanoma is the rarest and deadliest form of skin cancer; however, it’s also one of the deadliest forms, killing over 10,000 Americans each year. If you or a loved one have been diagnosed with melanoma, you may feel isolated, angry, or frightened, but help is out there. The MRF offers support groups for patients as well as caregivers, so anyone can ask a question, find a friend, and learn from others’ experiences. The peer-to-peer community offers people the resources they need to seek appropriate treatment and prepare for the challenges ahead. You can get involved with the MRF’s team of medical professionals, patients, and survivors by attending a fundraiser or educational symposium with your loved one. From its advocacy work to its educational materials, the MRF is a comprehensive and compassionate guide in the prevention, diagnosis, and treatment of melanoma. Kara McIntyre was 39 weeks pregnant with her first child when her doctor diagnosed her with melanoma. She couldn’t believe it. “I’m pretty sure I stopped breathing for at least a minute,” she recalled in a testimonial. She called her husband, Tyler, and cried on the phone. Then she called her mom and cried some more. 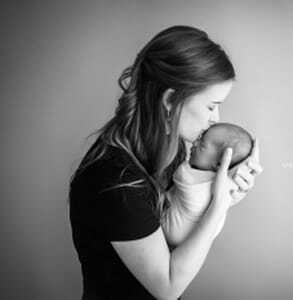 Kara’s doctors found a cancerous mole on her abdomen when she was pregnant with her son. Kara was a first-time mother with Stage 3 skin cancer, and she felt overwhelmed by fear and uncertainty. The next couple of months tested her strength, her faith, and her marriage. It wasn’t easy for Kara and Tyler to face so many challenges during what should’ve been one of the happiest times of their lives. Instead of devoting all her time and attention to her son Emmett, Kara had to spend her maternity leave going to doctor’s appointments, prepping for surgeries, and recovering her health. Throughout the long and painful process, Tyler stuck by his wife’s side, helping her to bathe, changing her bandages, and handling the day-to-day responsibilities while Kara focused on getting better. The Melanoma Research Foundation (MRF) provides supportive resources for melanoma patients, caregivers, and survivors. People like Kara and Tyler go to the MRF to learn more about this rare type of skin cancer and figure out how to deal with it. In 2018, the foundation estimates that about 178,000 Americans will be diagnosed with some form of melanoma, which accounts for 1% of all skin cancers. The disease affects people of all ages, from children to seniors, and is among the deadliest kinds of skin cancer. If you or a loved one have been diagnosed with melanoma, it’s important to remember you’re not alone. The MRF’s far-reaching network can help you prepare for whatever lies ahead. A melanoma diagnosis is often difficult for patients and loved ones to process. The ensuing fears and stresses can feel overwhelming, and people may not know what to do next. Patients can get in touch with the MRF’s support groups to meet people who have been diagnosed with melanoma, too. The MRF organizes a buddy system to ensure anyone anywhere can find a new friend. Whether it’s someone close to your age or someone who is facing the same diagnosis, the buddy program connects patients who can relate to one another’s experiences and challenges. The MRF also has two online forums — one for patients and one for caregivers — where people can go to support one another and get advice about how to deal with the disease from someone who has been in a similar situation. You can post anonymously on the Melanoma Patients Information Page, so you don’t have to be shy about asking a personal question. This is the largest and oldest online community of melanoma patients, and it’s there to comfort, aid, and educate people dealing with a cancer diagnosis. You can also read dozens of inspirational patient stories on the MRF website to hear people describe in their own words what it’s like to live with melanoma. The MRF represents a widespread community of people who have experience with melanoma. Whether you’re a cancer survivor or going through treatment, you can find others in similar situations by attending some of the MRF’s public events. Check the MRF calendar for upcoming opportunities to get involved. Washington, D.C., Denver, Philadelphia, Chicago, and New York host annual galas to raise awareness and money for melanoma research. The Wings of Hope for Melanoma Gala is a popular charity event held in honor of individuals who have battled melanoma. People don cocktail attire and enjoy a night dedicated to the cause of treating and curing melanoma. A 5k run/walk called Miles for Melanoma has raised millions of dollars for melanoma research and given thousands of families a chance to show their support for their loved ones. These marathons take place in big cities across the country, and thousands of energetic folks take part in the day of exercise, fundraising, and family fun. During the MRF’s Symposium Series, educational programs are held about once a month, and patients and physicians gather together to discuss current prevention, diagnosis, treatment, and research regarding melanoma. Over 1,400 people attend these events throughout the year. Experts and survivors travel from California to Texas to New York to raise awareness about the disease. The events always end by highlighting the personal journey of a survivor. Shelby said they choose to end the event this way to drive home the human impact of melanoma and let patients know they’re not alone. Almost every employee at the MRF has a personal story about surviving melanoma or losing a family member or friend to the disease. Their experiences often motivated them to get involved in the foundation’s efforts. They have seen what melanoma can do and know how important it is to offer patients support. 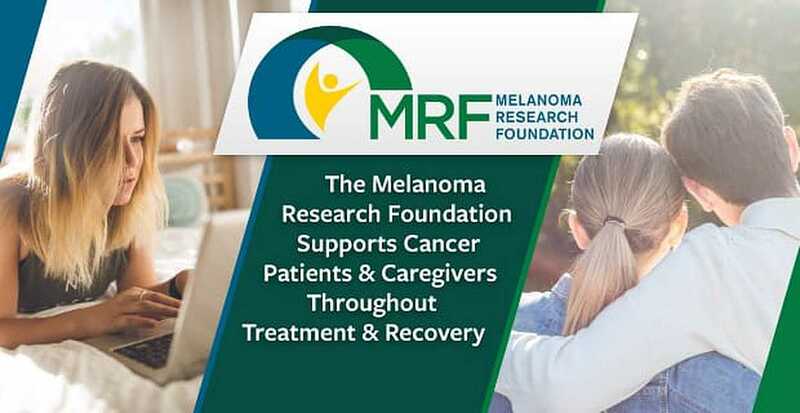 Everyone who works for the MRF shares a common purpose, and that unity makes them strong enough to uplift thousands of melanoma patients, caregivers, and survivors around the country. Together, the MRF leads the efforts to treat and cure melanoma. In addition to patient support, the MRF team puts substantial resources into its research center, which funds grants, clinical trials, and other scientific efforts to prevent or cure melanoma. The MRF Breakthrough Consortium is a high-impact group dedicated to accelerating the research and development of promising therapies to treat melanoma patients. “We’re proud of all the resources we’ve offered and dollars we’ve raised toward education and research on melanoma,” Shelby said. Today, nearly 1 million Americans live with melanoma. For patients like Kara who catch it early — her mole measured 1.08 millimeters when it was removed — the disease is usually curable. However, melanoma can be deadly once it has spread and metastasized throughout the body. The MRF estimates that melanoma kills over 10,000 Americans each year, and that number has risen steadily over the years. The Melanoma Research Foundation organizes support groups, fundraisers, and educational resources for melanoma patients and caregivers. The MRF’s positive programs and events give hope to thousands of cancer patients, survivors, and caregivers. If you’re looking for ways to show support for a loved one — or if you’re in need of support yourself — you can join the MRF’s online community of advocates. These passionate individuals work tirelessly to bring hope to melanoma patients and their families. Many families are forever changed after a cancer diagnosis. Kara was one of the lucky ones; she said surviving cancer gave her a new appreciation for all the love in her life. Now she holds her son close and tells her husband how much he means to her — because you never know what tomorrow could bring.